The likelihood that a stone will pass through to the bladder on its own is largely dependent on its size. Stones up to 4mm to 5mm have about a 90% chance of passing whereas stones larger than 8mm or so have only got a 10% chance of passing. 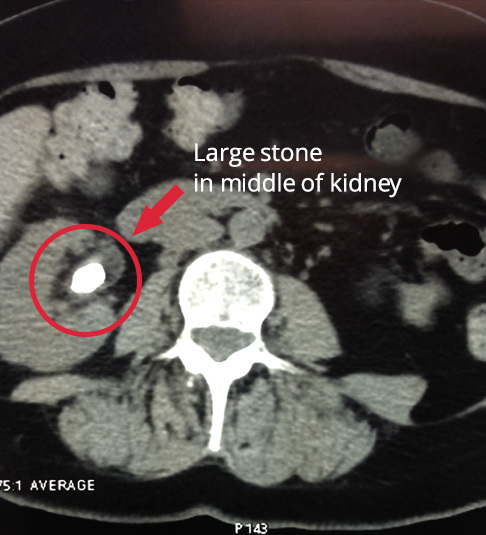 Stones will move down along the ureter (the tube that joins the kidney to the bladder) until the diameter of the stone is larger than the ureter and the stone becomes jammed in. To diagnose renal colic your Doctor will usually have arranged a CT scan which will quite clearly show the stone and the dilated ureter and kidney above. This will show the size of the stone and its position so that a decision can be made regarding treatment. Plain X-rays may also be used to help determine the composition of the stone. Some stones are amenable to dissolution therapy but these make up only about 10% to 15% of the total stones we see. Hard stones containing Calcium either need to pass spontaneously or need to be removed by surgical intervention. If you have renal colic it is reasonable to try to strain your urine to see whether or not the stone passes out of your body. This will obviously let you know that the stone is gone but it can also be sent for chemical analysis. Tests can also be performed to look for an underlying cause for the stone. This involves a blood test and a urine test (24 hour sample). Often these tests do not reveal any abnormality but if a specific metabolic abnormality is identified, there may be a simple way to reduce the risk of further stones from forming. These tests can usually be undertaken once the stone has been cleared as the results will not affect the immediate management of the blockage and pain.